Have the first two. Now need to add the third. 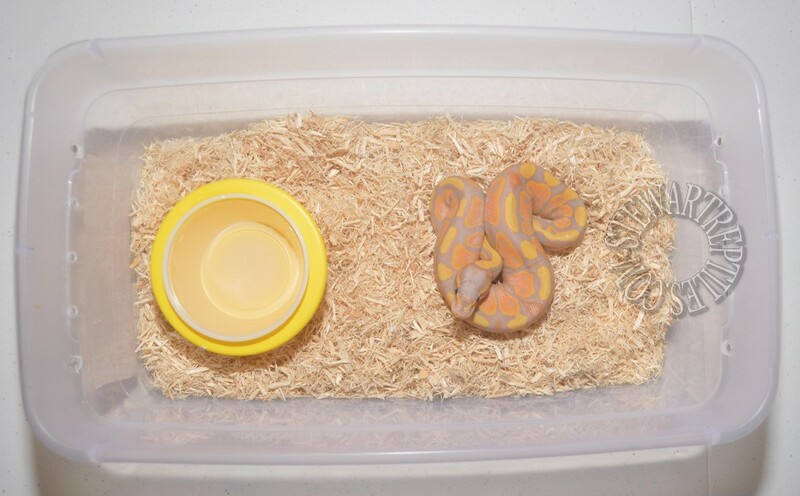 Every year especially when baby season is upon us, many people become proud new owners of their very first hatchling Ball Python, sadly more often than not the excitement often turn to frustration and worry when their new acquired pet refuse to eat for them. The good news is that YOU can get your animal to eat on it’s own but for that you will often have to forget everything you read, everything you were told, forget about what YOU want or like and be open to a PROVEN temporary method that has help many get their animal to feed for them. Ball Pythons unlike other species MUST have their needs met to a T, it is very important especially with an hatchling getting used to a new environment, among those needs SECURITY is the single most important one and should always be kept in mind. So how can you provide your hatchling with an optimum setup that will get you on tract rapidly, leading to a more enjoyable first time experience? If your hatchling is less than 200/250 grams here is what I always recommend. Use a 6 quart tub as enclosure; remember this is TEMPORARY, ideally until the animal reached 200/250 grams. Whether you dislike tubs or have the perfect 10 gallons setup ready to go it does not matter what matter it to provide the optimum setup which means cramped. Use aspen as bedding, aspen will allow your new pet to bury himself in the bedding offering added security should it be needed. Provide a small water dish. Provide temperatures of 76/78 on the cool side and 86/88 on the warm side (no higher) – You will obviously need a UTH, a thermostat and a reliable digital thermometer to achieve those requirements. Once you bring your BP home and place him in his new setup, LEAVE HIM alone, I know it is tempting to handle your new friend but it is best to let him acclimate to his new environment until he eats for you. Offer a live mouse (the ideal size will be equal the girth size of your snake) in the tub (do not feed outside the tub), close the lid and remove if un-eaten after 10/15 min. It might not work the first time around and in some extreme cased (un-started animals, picky eaters, rehab) it might take more than one try and additional little tips, but it can be done, and worry and frustration can become a thing of the past. This setup will also solve stress issues that can build up over time in very young animals even if they are eating. If you have additional question you can PM me, I will be happy to share additional tips and trick I might not have covered here. What's the morph of that baby? I got a fussy eater and even though he is six months old, he only weighs 121 grams. When he has eaten, it has been live mice only. Due to several factors, his last meal was February 11th and even though I only have had him for five days, I noticed cruising/hunting behavior last night so I gave him a live rat fuzzy today and perfect strike and no delay in eating!! I am hoping next week to give him another live and then maybe see about f/t. Your post is extremely helpful!